So, you want to buy an electric toothbrush? If you’re looking for the best electric toothbrush of this year, you’ve come to the right place. Wouldn’t you like to have a beautiful, healthy smile as you’ve always wanted? Yes! 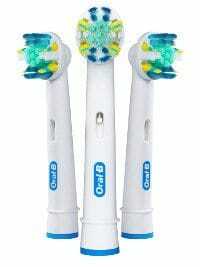 A good electric toothbrush, that can help you to get your desired smile. To help make sense of it all, here’s the ToothStars! We’ve tested and reviewed the top electric toothbrushes from most popular brands such as Oral B, Philips Sonicare, Colgate and more. Take a look at our best electric toothbrush list and read unbiased reviews by ToothStars’s expert. Here we’ve gathered best brushes, based on price, features, and customer’s feedback, you can buy this year. After careful review, these are our top choices for the best electric toothbrushes to buy. The most beautiful and elegant sonic toothbrush in the planet that will give you a brilliant white smile within a week! 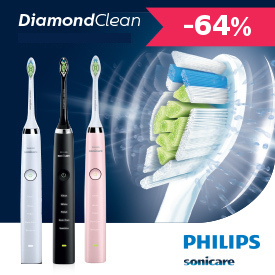 The Pricey Sonicare DiamondClean remains the bestselling premium toothbrush globally in last six month of this year. It is more expensive than many of its rivals but it doesn’t have pressure sensor or Smart-guide or Bluetooth to connect with smartphone. So, what is it about the Sonicare DiamondClean that sells it like hotcake! And makes it worth the money!! Its high-class design, superior materials and finishing, is clearly head and shoulders above other power toothbrush on the market. The body is soft and made of matt, ceramic-like paint coating, which is non-slip for comfortable brushing, while the handle is slimmest and smallest among all Philips Sonicare models. So who is not only looking for a toothbrush but pays attention to style in the bathroom, it’s stylish when it comes to design. An innovative interface with only one control button, the unique features, the elegant induction charging glass, and extra 5 brushing modes, you will get everything, what you’d expect from a modern sonic toothbrush and even a bit more. The Sonicare DiamondClean has five modes! When it comes to cleaning teeth,the performance is powerful! It vibrates at high speeds, makes 31,000 brush strokes per minute and drives fluid between teeth to break down plaque. Plus, the best part about DiamondClean is the way it makes your teeth whiter within a week, keep your gums healthy and freshen your breath! It has a two-minute timer and indicates when 30 seconds has passed to move on to a new section of your mouth, which can assist you achieve a balanced clean across all of your teeth. It also indicates when you’ve brushed for the recommended two minutes. Battery life is impressive – At full-Battery you’ll get around 42 cleans, which means you can keep going for three weeks before the battery needs topping up. After brushing your teeth, just placing the toothbrush in the elegant charging glass, that uses induction technology, to charge your DiamonClean in a very intuitive way. You can also use the glass to mouthwash after cleaning. It comes in three different colours, the standard – DiamondClean White, that seems nice. In addition, there is a new girly edition – DiamondClean Pink and a luxurious edition – DiamondClean Black. At Amazon, the reviews for the Philips Sonicare Diamond Clean have been excellent so far: which awarded an average of 4.5 stars by 800+ Customer. The Recommended Retail Price of this brush is actually £250, but you can save 55% right now & get it for £112.00 on Amazon.co.uk with Free Shipping. 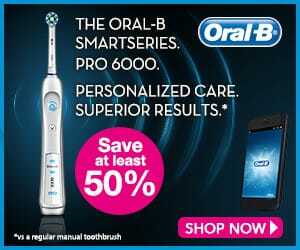 The Oral-B® PRO 6000 SmartSeries with Bluetooth® combines premium technology and care for a complete oral hygiene. If you are a gadget guy or gal, care about fancy settings or largely superfluous accessories, YOU MUST like this!! Equipped with the Bluetooth 4.0, in addition to the regular functions as an electric toothbrush can provide, it can send various information to your smartphone. Gadget! This is what we’ll see. It’s unique, and innovative, 3D technology provides 8,800 oscillations per minute + 40,000 pulses for optimal brushing, sweeping away plaque and the result is, truly satisfying feeling of a clean mouth. This electric toothbrush has five additional brushing modes and adapted to the problems of each (standard, massage, gentle, thorough cleaning and polishing). The Oral-B Pro 6000 has an excellent grip, with non-slip rubber on the back. It also has a pressure sensor to monitor your brushing and prevent from damage to the enamel of your teeth by pressing too hard. This toothbrush can be connected to your smartphone via Bluetooth to communicate key information, such brushing time per quadrant (upper left jaw, etc …), the time spent to brushing, too much pressure, types of cleaning modes with lots of pretty graphs on changes from day to day of brushing. Thus, you should easily adopt better habits and respect 2 minites brushing recommended by dentists. Battery life is excellent! – At full-Battery you’ll get around 42 cleans, which means you don’t need to top-up battery for three weeks. At Amazon, the reviews for the Oral-B Pro 6000 CrossAction have been impressive so far: which awarded an average of 4.3 stars by 600+ Customer. The Recommended Retail Price of this brush is actually £229.99, but you can save 70% now & get it for £69.00 (Only For Today!!) . 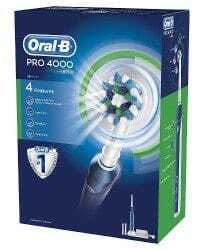 Currently, The Oral-B Pro 4000 CrossAction is the best selling electric toothbrush in Amazon.co.uk. As the brand already has an excellent reputation, Oral-B Pro 4000 must have something special. The Oral-B 4000 CrossAction comes with the advanced 3D cleaning technology with 40,000 pulsations and 8,800 rotations per minute, that will clean your teeth very thoroughly. Plus, it’s CrossAction technology also helps to remove more plaque. The built-in Protimer will give you signal after every 30 seconds, when its time to switch from one quadrant to the next and tell you also, if you have finished 2 minutes, the recommended dentists brushing time. Plus, it offers four different cleaning modes. You can choose from the following programs: Daily Clean, Gum Care, Sensitive and Whitening. Using 3D technology, Oral-B 4000 CrossAction is undoubtedly one of the most powerful that does not disappoint in terms of performance, handling and functionality. 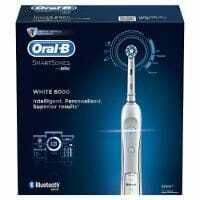 It is one of the best electric toothbrush for sensitive teeth & receding gums. Battery life is good enough! – At full-Battery you’ll get around 32 cleans, which means you don’t need to charge the battery for two weeks. At Amazon, the reviews for the Oral-B Pro 4000 CrossAction have been good so far: which awarded an average of 4.5 stars by 600+ Customer. The Recommended Retail Price of this brush is actually £109.99, but you can save 61% now & get it for £42.89 . If you are looking for an affordable entry in the world of power toothbrushes, Oral-B PRO 2000 CrossAction is the best for you. The price starts from £27.99 with 60% discount on Amazon. An inexpensive battery-powered toothbrush, that is equipped with the 3D Cleaning Technology, oscillates, rotates and pulsates with CrossAction brush head to busting and sweep away plaque. This CrossAction brush head is inspired by dental instruments used by dental professionals. It has dynamic 16-degree angled bristles, on several levels, to cover the tooth and optimally reach deep between teeth. Strengthen with 3D cleaning technology, this dynamic 16-degree angled bristles can attack effortlessly tooth-by-tooth, break down and remove more dental plaque and will give you a superior cleaning than a regular manual toothbrush. 2. Gum Care to massage your gums. It has a visible pressure sensor, that signals red, automatically reduces brush speed when you apply too much pressure and helps you to protect your teeth and gums. In no time, you will learn to brush your teeth with proper pressure without even thinking about it! Plus it also has a 2 minutes timer, that will remind you every 30 seconds to change the quadrant, and allows you to respect the proper brushing technique recommended by dentists. 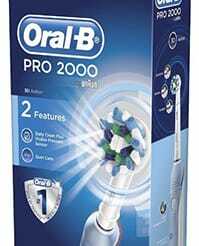 Oral-B Pro 2000 is also compatible with All of the Rotating brush heads by Oral-B: such as FlossAction, 3D White, deep-cleaning, Sensitive Clean, TriZone, and Precision Clean. Battery life isn’t bad – At full-Battery you’ll get around 20 cleans, which means you’ll only need to charge it every 10 days or so. At Amazon, the reviews for the Oral B Pro 2000 CrossAction have been excellent so far: which awarded an average of 4.6 stars by 900+ Customers. The Recommended Retail Price of this brush is actually £49.99, but you can save 60% now & get it for £27.99. Here are best three electric toothbrushes are ideal for people, who have sensitive teeth and gums, and also safe for use with braces. What type of electric toothbrush should I buy? So, you are moving from a manual toothbrush to an electric toothbrush: it tempts you, but you have not taken the dive yet? The price may retain you, or you are unsure which electric toothbrush should i buy? How to choose? In battery cells, disposable? Sonic, oscillating-rotating, three-zone? Which electric toothbrush do dentists recommend? Which is the best electric toothbrush on the market this year? While, There are few players share the market, but the technology and offer are extensive. So, What kinds of electric toothbrushes there at all? In early 90s, simple electric toothbrushes were on the market. The teeth are cleaned with a battery-powered rotating brush head. The rotary brush are guided along each tooth, and from all sides. Electric toothbrushes use rotating technology with round brush head. The round brush head rotates rapidly alternating left and right – driven by a battery-powered electric motor. This movement is also called 2D technology by manufacturers; it is mainly present in Oral-B (Braun). For example, the entry level Oral-B Vitality Precision Clean uses this method. There are now many different shapes and compositions of the bristles in the rotating brush head. However, the principle remains the same at all. 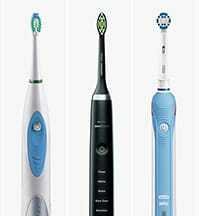 The rotary brushes are still widely used and represent a low-cost entry into the world of electric toothbrushes. There are some high-end models that combine pulsations and rotations. This technology is also called 3D technology, mainly presented by Oral-B. Oral-B has also developed a new technology called TRIZONE. Are Electric Toothbrushes Better Then Manual Toothbrushes? Is it worth a rotating electric toothbrush compared to the manual toothbrush? There are a lot of comparable studies on the question of whether an electric toothbrush has a better cleaning result than an ordinary manual toothbrush. However, none of these studies come to a definite conclusion. Maximum people do not brush their teeth the right way when using a manual toothbrush, which can lead to plaque buildup and poor dental health. The cleaning result strongly depends on your hand. If you own an expensive electric toothbrush, still you have to brush your teeth properly. Although the technology indeed brings incredible comfort in your brushing experience. When I brushed my teeth for the first time with a rechargeable rotating toothbrush, I had light bleeding gums. That is due to the rotational movements and goes away after a few applications. However, you must press the rotating brush onto the tooth. As a result, the tooth enamel is damaged, and the damage of the brush head is comparatively high. Some Electric toothbrushes use a technology called Sonic. A few years ago sonic toothbrushes were presented. These are more advanced devices, Usually equipped with a wider head, almost the size of a manual toothbrush. In sonic toothbrushes, the brush head does not rotate but vibrates – driven by sound waves with more than 30,000 oscillations per minute. Also, pressing the toothpaste / saliva solution in between teeth where 90% of the bacteria sit. That do not make the rotating head. In this case, less pressure is needed and protect the tooth enamel. In addition, the cleaning effect is slightly better and the interdental spaces, be better achieved. Philips patent this technology and that sonic models only offer by this manufacture, from entry-level to high-end. 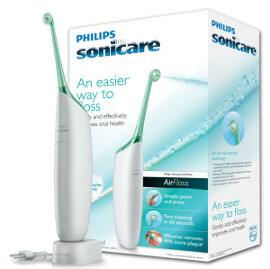 The sonic toothbrushes are also usually considerably more costly than the simpler rotary brushes – more on that later. Is it worth a sonic toothbrush, compared with the standard rotary toothbrush? As already mentioned, the rotating brush must be performed on each tooth along. That is because their brush head is round and, therefore, can not capture as much tooth surface at a time. The sonic toothbrushes, however, have a larger brush head can cover more tooth surface at a time. Tooth brushing is slightly easier and faster to get the desired result. I also find that the teeth feel smooth after using a sonic toothbrush. Although it is a purely subjective feeling, should be mentioned anyway. Apart from these two aspects, I look at sonic toothbrushes no significant advantages over the rotating brushes. When I switched from a rotary brush on a sonic toothbrush, everything has tickled and tingled in the mouth at me at first. That is due to the vibrational motions and gets used to it pretty quickly. It should decide for themselves whether to purchase a sonic toothbrush is worthwhile for him. If you consider that a brand unit can be used 5-10 years, her slightly higher price relative to a simple electric toothbrush. The ultrasonic brushes represent the technological lead of dental cleaning technology. The tooth cleaning is done with these devices not mechanically, but by high-frequency oscillations and with the aid of special toothpaste. I find it interesting that ultrasonic toothbrushes with a conventional toothpaste does not work: Thus, the toothbrush has an antibacterial effect. The brush does not clean at macro, but at the micro level. The ultrasonic toothbrushes are obviously the most expensive option of electric toothbrushes. Is it worth buying an ultrasonic toothbrush? Apart from cheap Chinese imitations, there is currently only one brand – the Emmi-dent ultrasonic toothbrush. The Emmi-Dent has sort of a monopoly in the ultrasonic segment. That is why the price is well above the 100 pound. In addition, the brush works only with special toothpaste, indeed from the same manufacturer. of course, All these are increases the subsequent costs of an ultrasonic toothbrush. The brush your teeth with ultrasound is quite used to – it distributes the toothpaste and then switches to the toothbrush and leads them slowly past each tooth. Since you can not see, or ultrasound feel a small vibration motor built into the hand-piece. So you get at least that the toothbrush works. The cleaning result will indeed be neat, but not better than a regular electric toothbrush. In my view, the only significant advantage of ultrasonic toothbrush that there is no mechanical contact with the gums. If the gum is therefore very sensitive, the high-tech cleaning makes sense. In all other cases, honestly I see no reason, why you should switch to an ultrasonic toothbrush. The standard sonic toothbrushes are cheaper to maintain and at least as good, as a result. I think it is a very remarkable way that no known manufacturer has the ultrasonic toothbrush on offer. Maybe the reasons mentioned earlier? In any case, the ultrasonic toothbrush remains in my test of the best electric toothbrushes against the outside.